Sir Winston Churchill adored them and they can be your reason to relax. Romeo and Julieta Cigars, better known as Romeo y Julieta cigars, are more than 135 years old but can be stiff competitors to the new and popular cigar brands. Combining the qualities of Cuban and Dominican Republic flavors and blends, these cigars impress with their construction, presentation, aromas and quality. 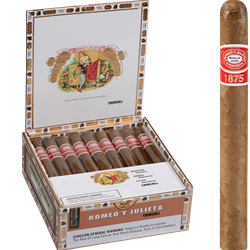 Buy Romeo and Julieta Cigars online with us to save money and enhance the joy. You won't find lower prices on Romeo and Julieta Cigars anywhere on the internet.